Tag Archives for " Emma Vaughn "
As a small business owner, you have too much on your plate and not enough time to worry about posting engaging content on social media. It’s hard enough running your business, let alone planning the comprehensive content marketing strategy needed to keep up with your competition and get the attention of new customers online. Never fear! Here are some quick and easy, real-time, and user-generated content ideas that busy small business owners can post in a pinch. These are the types of content we utilize at Main Street Hub on behalf of our local business customers to help them get more customers and keep them coming back. When a customer stops by and posts about your business on their personal pages, they are giving you free, user-generated content to use. For a quick post on your business’ channels, you can reshare or repost that content! Feel free to use that content on the same platform or different platforms. 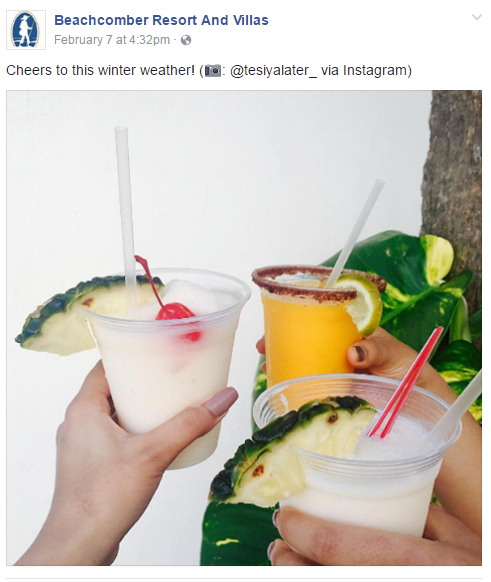 If a customer tags you in an Instagram post, you can share that photo on Facebook. Just grab the link on Instagram, credit the user by adding their username, say thank you, and post on Facebook! If a customer shares a great photo of your business on Twitter, hit “Quote Tweet,” write a message letting them know you’re happy they stopped by, and add their handle. 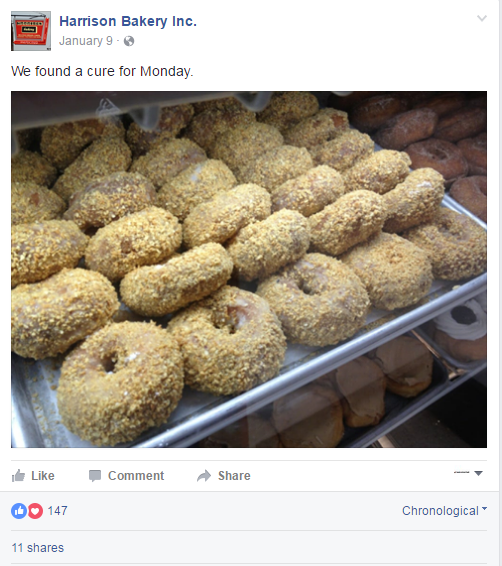 Every user-generated post is a chance for you to show your business in real time and stay top-of-mind for new and loyal customers. It’s also an excellent way to engage with your audience and start conversations. 2. Show off your product and services! Posting photos of your interior, exterior, team, and products with a short, engaging caption really shows visitors to your page what they will find when they visit your business. You can post a photo of an employee, your product, or an event happening in real time, or use Facebook Live to broadcast what’s happening in the moment. Never used it before? No problem. You’ll only need to go live for a few minutes to grab the attention of your fans and followers. For example, if you own a restaurant, take a video of your lunch hour. Go behind the scenes to the kitchen and talk to the chef. If your store is having an event, get your smartphone camera ready and go live! It’s a quick way to get your fans excited about what’s happening at your business. Asking your followers questions is an easy way to get more users interacting with your pages. You can ask, “What’s your favorite dish we serve?” or “What class would you like to see our studio offer?” These posts will get people talking on your page and engaging with your posts. More engagement means more eyes on your pages and your brand, plus it’s an awesome opportunity to gather customer feedback. You can also post valuable tips, insights, and inspiration relevant to your industry to build trust and rapport with your current and future customers. If you own a gym, give helpful workout tips. Own an auto shop? Tell fans how to change a flat. You’re the expert on your business, so share that with your fans, they’ll be happy for the insight! So, you got a 5-star review on Yelp. Congrats! Now, go show your audiences on your other social media pages! Sharing positive reviews from Yelp to Facebook and Twitter is the best way to show your audiences on other platforms what your customers are saying about your business. Just copy the text of your Yelp review, credit the reviewer, and add a message of thanks. Several apps online, like Canva, can help you turn text into a visually appealing graphic, which is perfect for this setting and will catch the attention of more users. This is a creative way to share customer love and bonus! 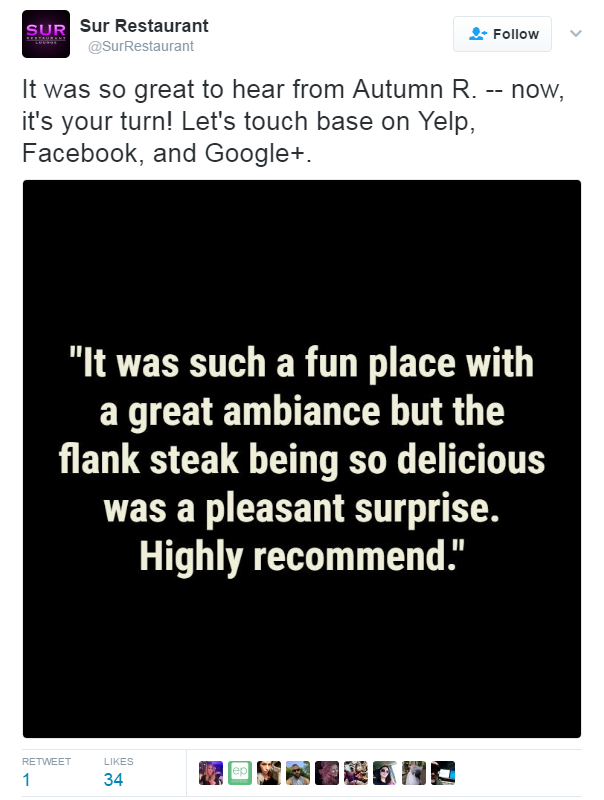 It reminds other happy customers to go to your Yelp page if they want to leave a review. When it comes to your business on social media, aim to be informative and engaging through real-time, user-generated, and cross-promotional content, and make sure you’re actively interacting with fans and visitors. Posting exciting content and managing your community will be sure to hook potential customers, encourage them to swing by for a visit, and keep them coming back. At Main Street Hub, our team of experts takes care of social media and reputation management for local businesses to extend their customer service online and build relationships with current and potential new customers. Learn more about how we can help your business here. Emma Vaughn leads Main Street Hub‘s local business outreach. She hosts educational workshops and webinars to help businesses get more word-of-mouth and referrals on sites like Facebook, Twitter, Yelp, & Foursquare. Emma has cultivated partnerships with industry leaders such as SCORE Los Angeles, SBA, California Restaurant Association, Long Beach SBDC, and various chambers of commerce.